I suspect one of the key reasons I love spending time in the kitchen is to engage in the act of transformation - working with a list of ingredients with the intention that the result will be greater than the sum of its parts. As cooks, we constantly have the opportunity to delight those that sit at our tables. Perhaps it is a bit like being a magician. Present a great dish and guests always want to know, how did you do that? 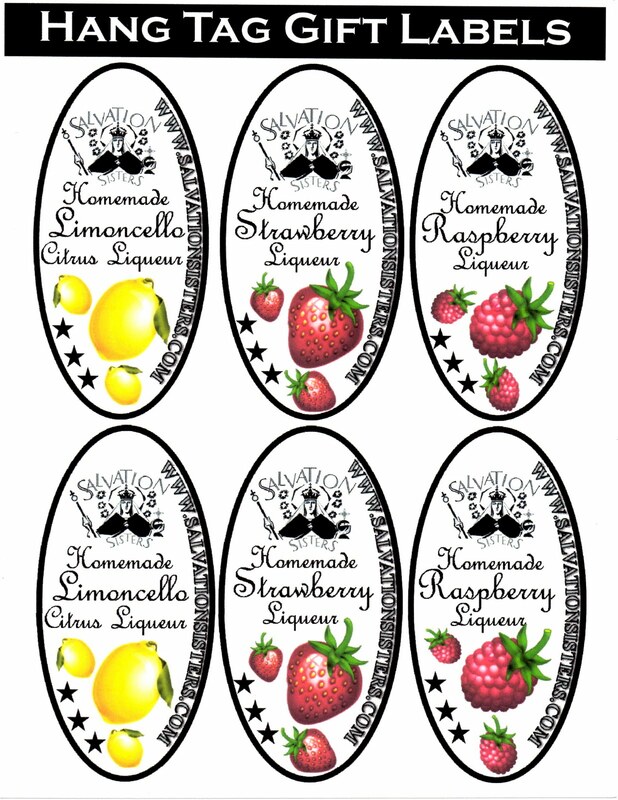 The first time I tasted Limoncello, it was Linda's homemade concoction. The pale yellow liquid was a taste revelation. I instantly wanted to know how she made it - EXACTLY how she made it - quizzing her intricately on the ingredients and process. 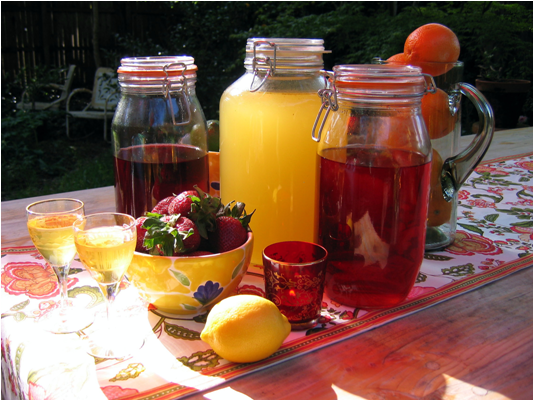 If you have not yet made a fruit liqueur, you are in for a treat. 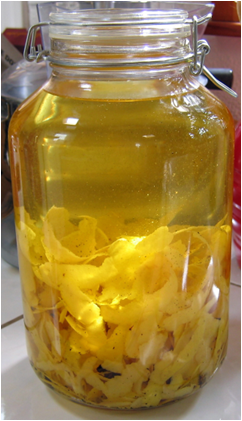 Although the actual process to combine the fruit or peels with the vodka is as easy as can be, it does require a little patience because you must wait anywhere from a week, on up to a month, for the alcohol to extract all the essences from the flavoring agents, and then again after the liqueurs are diluted with some water and sugar. At Linda's house, we recently found a jar of Limoncello that had mellowed for quite some time - about two years. Wondering how it would taste after resting for such a long time, we moved into investigative research mode, removing and discarding the peels, and adding sugar syrup. Happily, it tasted great. Lemon peels are resinous which requires the addition of some Everclear or 100-proof vodka to extract the flavor, whereas soft fruit does not require it because it's not difficult to break down. Once the fruit or peels have lost all color, they are removed from the alcohol, and sugar syrup is added. Limoncello benefits from additional aging after it is sweetened because the higher proof alcohols are given time to mellow. 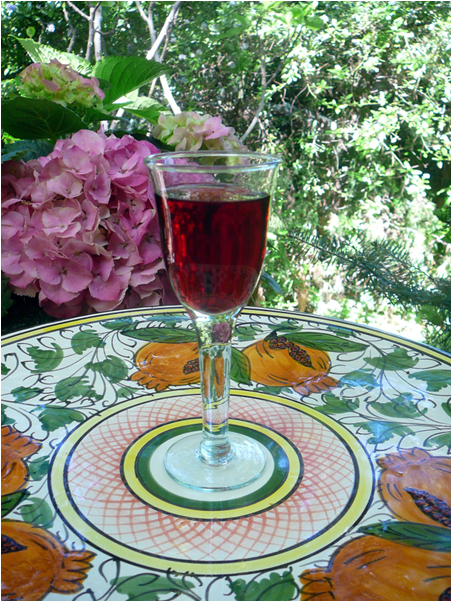 Likewise the berry liqueurs also benefit from some aging - anywhere from two weeks to six months -and will taste smoother on the palate. To make the Limoncello, it takes patience to carefully peel twenty lemons, but when you can extract Spring in a bottle and uncork it at a later date, we sisters think the long-term goal is worth the short-term bother. The good news is that the Strawberry and Raspberry Liqueurs do not require fresh fruit, frozen is great. If using frozen fruit, keep the fruit whole and simply combine the fruit with the vodka. In fact, because the cell structure has been compromised by freezing, you do not have to use anything stronger than regular vodka to extract the fruit. As an added bonus, thankfully, there are no pesky peels to remove. Fresh fruit, on the other hand, must be chopped into small pieces and then added to the vodka. Likewise, vanilla beans are split in half, the inside scraped into the mixture and then the pod is finely chopped and added as well. In our posting for Pineapple Martinis, which is made by extracting fresh pineapple and vanilla in vodka and Malibu rum, we discussed the various vodkas that are available on the market. Our vodka of choice for making liqueurs is Monopolowa of Austria that is distilled from potatoes. It is inexpensive, about $10 for a one-liter bottle, purchased at Trader Joe's. We keep the empty bottles and reuse, transferring the finished liqueurs from the jars into the bottles for aging and long-term storage. The labels soak off easily and the bottles can be stored in an orderly fashion in recycled wine boxes (or buy a case of the vodka.) Deflect the sideways glance from the clerk with a friendly smile. Fruit liqueurs are enjoyed "neat" in pretty cordial glasses, on the rocks, or mixed into a variety of cocktails and desserts, such as Wilkins Family Lemon Ice Cream. Poured into decorative bottles, the liqueurs become cherished hostess and holiday gifts. For a nice touch, include lovely cordial glasses along with the liqueur. You can typically find deals on sets of glassware at Ross and Marshalls. 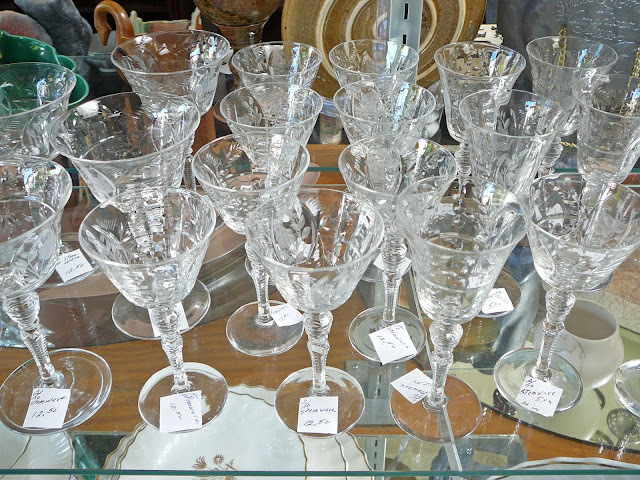 We also like to drop by our local thrift stores where expensive etched crystal stemware can be found at rock-bottom prices. 1. Zest lemons* using a vegetable peeler (my preference) or knife, being careful to avoid the white pith, which is bitter. This takes a bit of patience, but keeping the white pith out of the alcohol is really important to the final quality o the Limoncello. Combine Everclear**, vodka and lemon zest in the jar. Set aside in a cool, dark place for at least one week, shaking the jar daily. When zest turns pale and alcohol has a deep yellow color, strain through a sieve, and return to the glass container. Discard zest. 2. Combine sugar and water in a medium saucepan over medium heat. Stir until the sugar dissolves and the syrup is clear, about 5 minutes; do not boil. Cool to room temperature. 3. Add 4 cups of the simple syrup to the infused vodka. Stir and taste. Add additional simple syrup, a little at a time, stirring well and tasting after each addition, until you have the right balance for your palette. 4. Seal the jar, and store once again in a dark place, for a week or longer, to allow the flavors mellow. 5. Pour liqueur into bottles, if you like, using a funnel. Close with corks or screw tops. The liqueur will keep indefinitely and continue to develop in flavor the longer it rests. 6. Serve at room temperature or cold from the refrigerator or very cold directly from the freezer. * Lemons deteriorate quickly without their peels. Juice the lemons to make lemonade, or pour juice into ice-cube trays; freeze. Remove cubes and store in a resealable plastic bag in the freezer. When a recipe calls for 1-2 tablespoons of lemon juice, remove a cube, defrost (doesn't take long) and use. ** It is important to use Everclear (151-proof) to extract zest. The higher the proof of the alcohol, the faster the essence of the lemon will be extracted. If you cannot purchase Everclear in your state, exchange the Everclear and all the vodka in this recipe for 100-proof vodka. 1. To Make Aranciacello Orange Liqueur: Exchange organic orange peels for the lemon peels. 2. To Make Lemon Extract or Orange Extract: After straining the zest from the infused vodka, and before adding simple syrup, transfer desired amount to a impecably clean, well sealed bottle. Store in a cool, dark place. Use as needed for all recipes that call for the required citrus extract. 1. Combine vodka and strawberries in jar. Seal and store for about a week, shaking every day or so. 2. Remove strawberries and discard. 3. Combine sugar and water in a medium saucepan over medium heat. 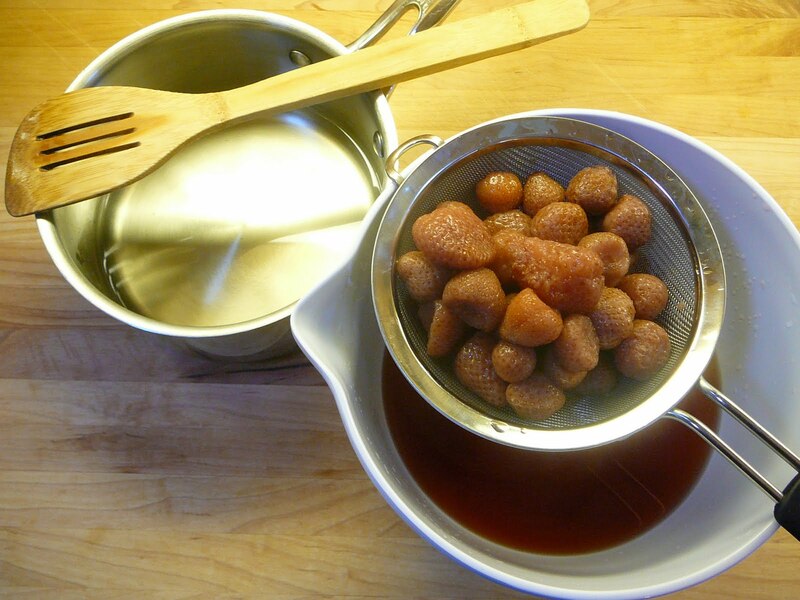 Stir until the sugar dissolves and the syrup is clear, about 5 minutes; do not boil. Cool to room temperature. 4. Add 1 cup of the simple syrup to the infused vodka. Stir and taste. Add additional simple syrup, a little at a time, stirring well and tasting after each addition, until you have the right balance for your palette. 5. Seal the jar, and store once again in a dark place, for about a week or longer, to allow the flavors to mellow. 6. Pour liqueur into bottles, if you like, using a funnel. Close with corks or screw tops. The liqueur will keep indefinitely and continue to develop in flavor the longer it rests. 7. Serve at room temperature or cold from the refrigerator or very cold directly from the freezer. 1. 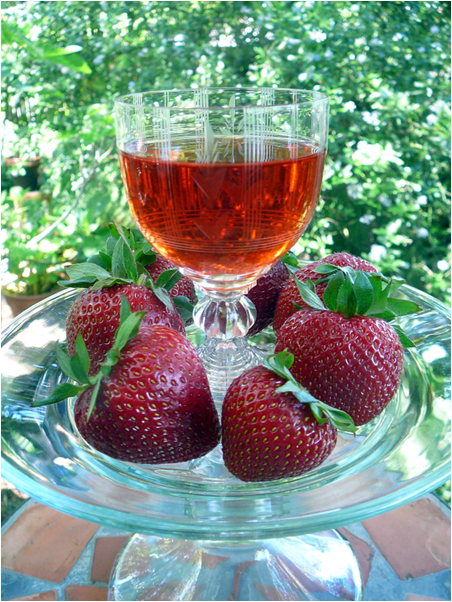 To make Strawberry Extract: After spent strawberries from the infused vodka, and before adding simple syrup, transfer desired amount to a impecably clean, well sealed bottle. Store in a cool, dark place. Use as needed for all recipes that call for the required fruit extract. 1. Combine vodka and raspberries in jar. Seal and store for about a week, shaking every day or so. 2. Remove raspberries from vodka and discard. 3. Combine sugar and water in a medium saucepan over medium heat . Stir until the sugar dissolves and the syrup is clear, about 5 minutes; do not boil. Cool to room temperature. 5. Seal the jar, and store once again in a dark place, for about a week or longer, to allow the flavors mellow. 1. To Make Raspberry Extract: After removing spent raspberries from the infused vodka, and before adding simple syrup, transfer desired amount to a impecably clean, well sealed bottle. Store in a cool, dark place. Use as needed for all recipes that call for the required fruit extract. Just read the Limoncello recipe and have question. Is it 3 bottles of Vodka or 3 cups. I believe it state 3 bottles of 750 ml 80 proof vodka correct? Also you use both Grain and the Vodka correct? Yes, to both questions. Three bottles of vodka and 4 cups of Everclear. The recipe makes quite a lot of Limoncello. I've never minded though as it is always nice to have on hand or to be able to given portions as gifts. Thanks for stopping by and your questions and feedback are always welcome. We love to hear from you! Hi Carol... most recipes for Limoncello use a higher proof alcohol than regular 80 proof vodka (which is only 40% alcohol). Citrus peels are resinous, and benefit from a higher concentration of alcohol than just using regular vodka. That is why Everclear is used, too, since it is 95% alcohol. I have tested our homemade lemon extract in our family Lemon Ice Cream (http://www.salvationsisters.com/2010/05/wilkins-family-lemon-ice-cream.html) and it is delicious. It is and added bonus that it really is a huge monetary savings to make your own. The Lemon Tea Bread sounds yummy. Where do you use the vanilla bean in the lemoncello? The chopped vanilla bean (if you choose to use it) can be thrown in the mixture with the lemon peels and vodka. Have you ever made green walnut liqueur? I made a batch this past spring and it still tastes extremely bitter and am wondering if it will ever mellow out. Some recipes have said give it a year. I am assuming that you made your Green Walnut liqueur from the hulls of the walnut? 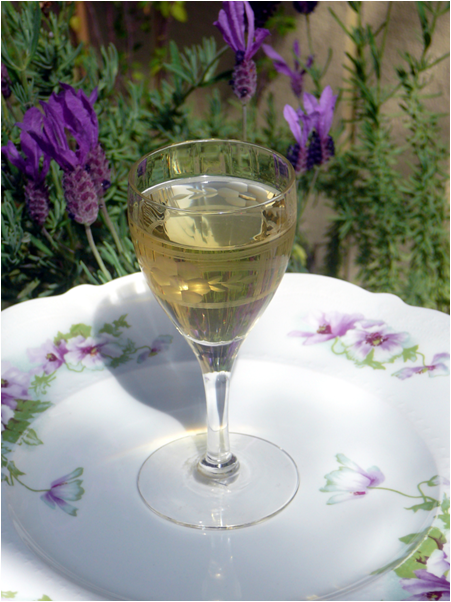 I have never used walnut… hulls or no, as an ingredient in a liqueur, but speaking as an herbalist, walnut hulls are used as a treatment for parasites, but so is Wormwood, which is used to made the very famous Absinthe. Lengthy aging of the liqueur sounds like a good idea, and you might want to try mixing it with another liqueur or cordial to reduce the bitterness.